You can never have enough chargers or Lightning cables. Inevitably, when you need one, you can't find one. Thinium has released a remarkably compact charging unit for Lightning devices that collapses into the size of a couple of credit cards. Through Transformer-like technology, the unit expands to reveal two prongs to plug into a wall outlet, as well as a Lightning connector, and a stand which can support the weight of an iPhone. The idea is to plug the Thinium Charge into the wall, pop out the Lightning dock, plug in an iPhone to the Lightning port, and have the iPhone supported on the wall. It's a clever design that works with the new iPhones, but I wouldn't recommend an iPad mini, which weighs too much and requires more power than the 1 Amp provided. 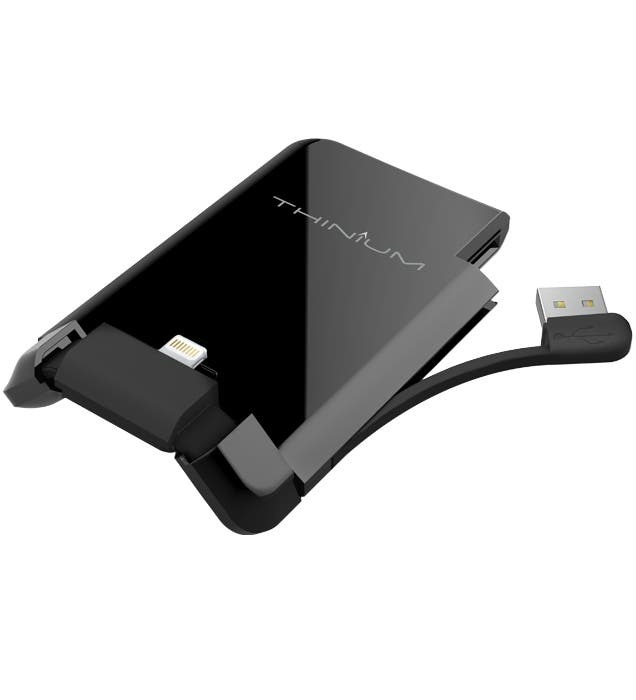 When the Thinium Charge isn't needed, it folds back to pocket size and you can throw it in your gadget bag or pocket. There's even a pull-out USB cable to let the device work as a Lighting sync cable for a Mac or PC. The one missing feature is a built-in battery that lets it act as a portable battery pack. Fortunately, Thinium has thought of this and the ReCharge will be coming soon and should have a 2100 mAh battery in a similarly thin form factor!